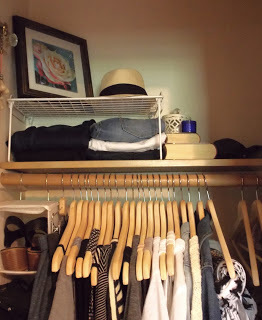 What is a capsule wardrobe? From my research, I’ve gathered that a capsule wardrobe is a small, concise wardrobe that you pull out at the start of each season. Capsule wardrobes tend to be filled with fewer, high quality clothing instead of more, low quality clothing. That’s pretty broad right? Let’s dig into my ground rules for some direction. I will use the four seasons as my guideline for changing out my capsules: June-August, September-November, December-February, and March-May. I will not choose a predetermined number limit for my capsules. Why? I am very goal oriented… to a fault and I want this process to be organic. However, my goal will be to whittle each capsule down to the smallest number I feel I can live comfortably with. This isn’t an exercise in asceticism. Right? I will include clothing and shoes in my capsules. I will not include underwear, accessories/bags, workout gear, and backup jackets (due to living in a climate that can change at a moment’s notice). Even though I’m not including these things, I will also try to live with as little as possible in these areas. Speaking of weather, I will not forbid myself from digging in storage for a sweater if we suddenly get a 45 degree day in August. Stranger things have happened and I refuse to freeze. However… I will not shop once my capsule is closed. Each capsule will close on the first day of the month the capsule begins. I will then cease and desist all shopping until three weeks before my next capsule begins. The point here is to do my shopping in a controlled way. By doing so I take out the impulsiveness and the emotional aspect of shopping. I will only spend what I have budgeted for each new capsule. This will most likely translate to one to three nice items or a handful of thrifted items. If you’re wondering what I did with the remainder of my clothes, I pretty much got rid of most of them. I know – drastic. But, sometimes you have to be drastic in order to effect change. What I have left is one large tote of clothing for other seasons, one large tote of shoes/purses/accesories, and one large tote of maternity clothes. I’m going to do my best to never need to keep more than that in storage, but I’m also going to give myself room to change my mind if I need to (sweaters are bulky y’all). I think that sums it up! Let me know if I missed anything or if you have specific questions. I’ve already been doing my first capsule for a couple of weeks now and I’m excited to share it with you on Friday. In the meantime, if you are interested in digging a little bit deeper, I mostly pulled from this blog and this blog when doing research. Happy reading!